You know those days when you somehow wander down the time warp black hole that is Youtube… and instead of watching kitten videos you find yourself watching video after video of a crazy cake maker and her themed fondant cakes… No? Ok, maybe I’m alone on this one. 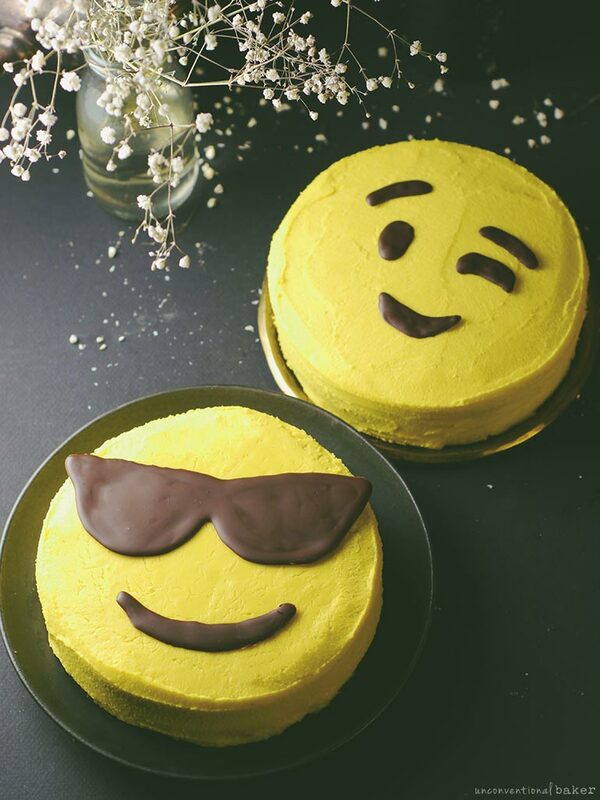 But it’s a true story nonetheless… After seeing fondant cake after fondant cake I felt hooked on the idea of making a fun themed cake… only I really REALLY don’t like fondant :S But when I saw an emoji cake I thought “Aw, how can I NOT make an emoji cake now? 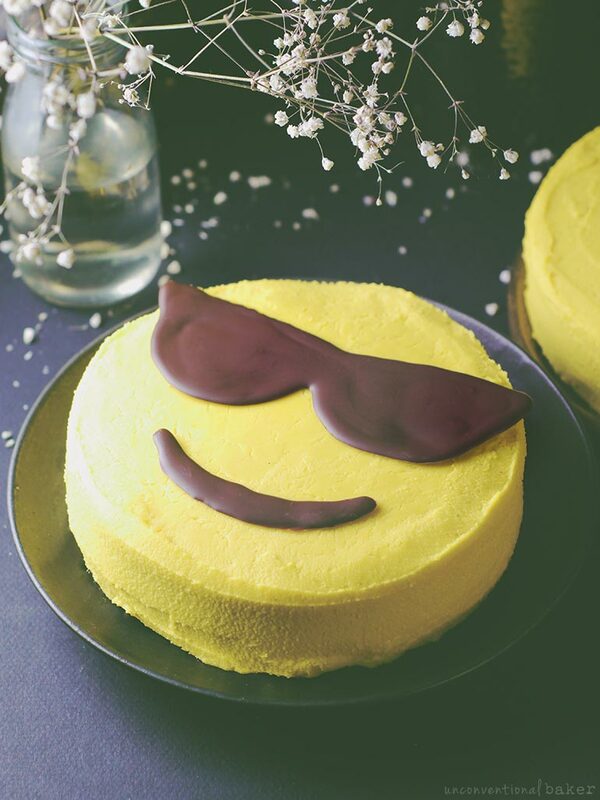 !” … and so, all inspired (and perhaps a little overstimulated by some special chocolate) I headed into the kitchen and made spontaneous emoji cakes — sans fondant, and infused with stuff I can actually eat! 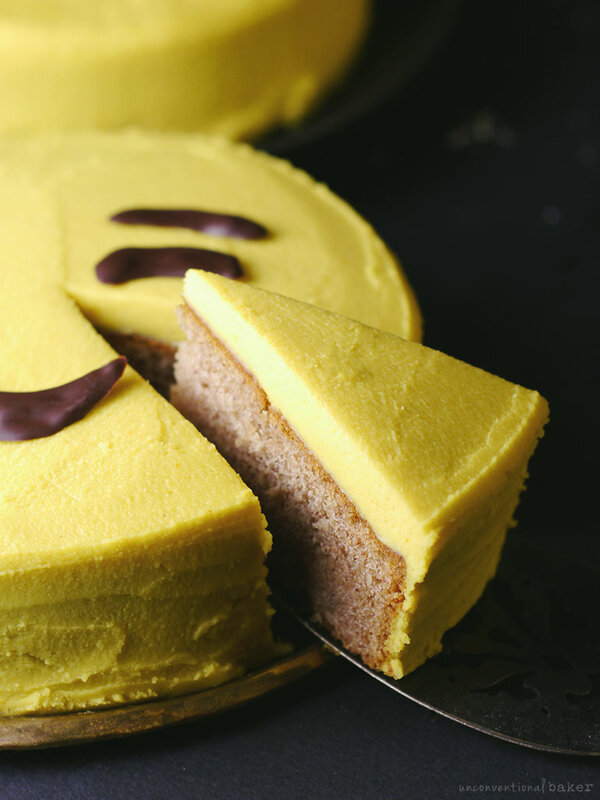 So… this post isn’t so much a cake recipe, because the truth is there are many ways to enjoy an emoji cake… You can make the cake base whatever cake / flavor you like (I’ll give options further down). 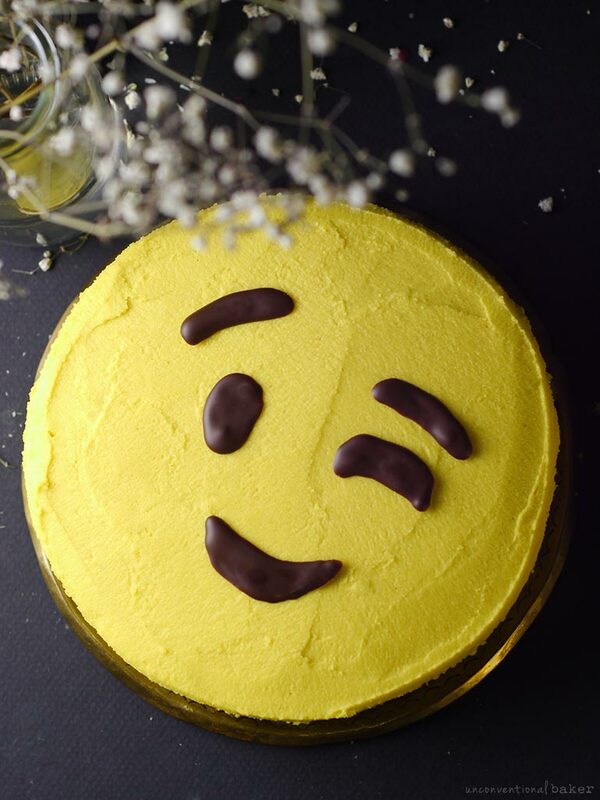 And there are options for different diet-friendly frostings, too… But I thought I’d share my process in case, you know, you’re also a little emoji obsessed and can appreciate the humor of whipping one of these cakes out to surprise someone… ? I started off by making the frosting first, because the frosting I used needs time to set — hours. I didn’t go with fondant because a) I’ve never been a fan, and b) It’s nearly impossible to make a workable fondant without a boatload of ingredients I can’t have, and c) Commercial fondant is filled with a lot of things that scare me. I know it’s ok for an occasional treat, but what’s wrong with a more approachable and wholesome frosting instead, you know? 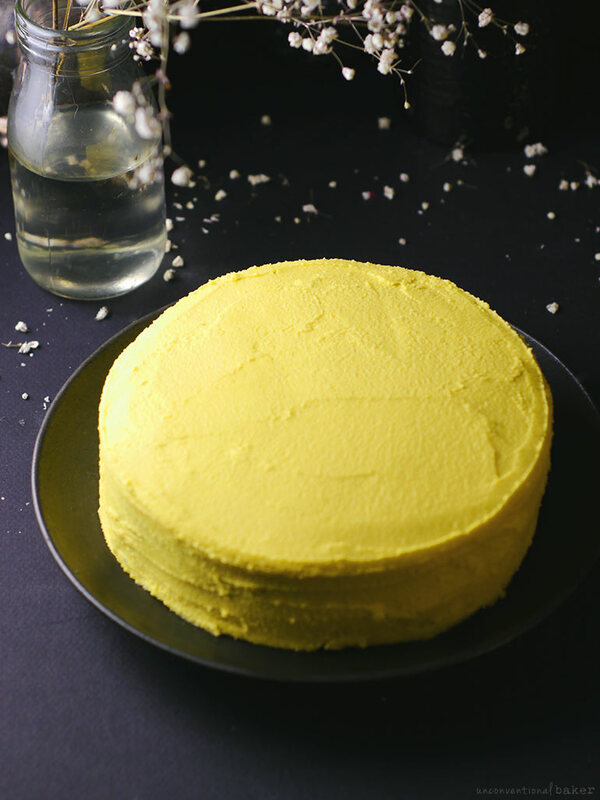 I used the frosting from this classic cashew vanilla birthday cake, but added 1 tsp turmeric. Worked a treat for a gorgeous natural yellow. And the other flavors in the frosting overpower the taste of the turmeric, in case you’re not a fan… So I made it and popped it into the freezer. Then baked my cakes (I made 2 six inch ones), let them cool, and then frosted when the frosting was chilled and firm enough to work with. Blank canvas ready. You could in theory now paint any emoji you like straight on the cake… but I have to fess up — I’m a huge wimp and get a paralyzing fear of screwing up a cake when it comes to writing on cakes. Just one clumsy error and the whole thing ends up mucky… so I opted for an easy fix — make the chocolate “features” separately. I went with chocolate for obvious reasons: easy, wholesome, delicious, non-fussy. If you choose an emoji that’s complicated (i.e. multi-colored) you’ll need to be ready to introduce other ingredients into the mix — possibly food colors (or natural berry or veg powders, some coconut oil, a sweetener). 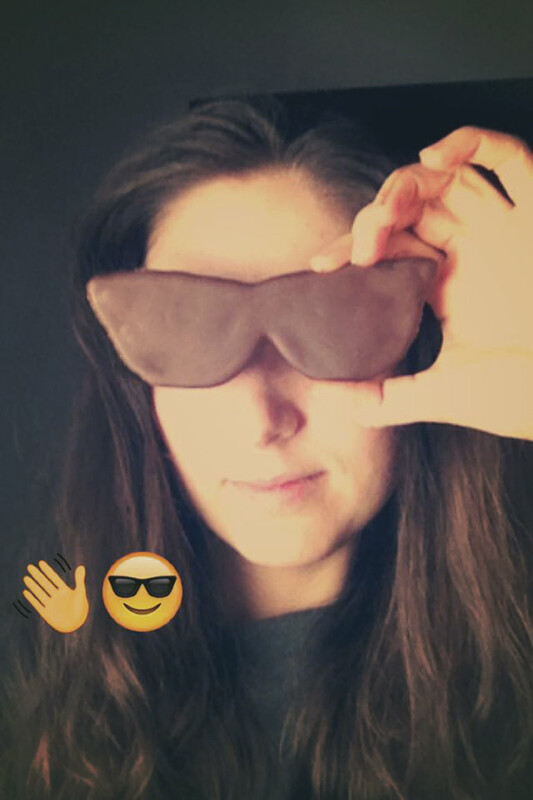 I just wanted to keep things simple — plenty of emoji that I love and that do well with just simple chocolate. Like ??? ?… You get the idea. But you’ve also got plenty of room to improvise and make others, too. (See, I told you I wasn’t very gifted at drawing ?). Ok, so once the parchment is taped (this is important so it stays super flat), pop it into the freezer for about 10 minutes while you melt your chocolate. A chilled tray will help the chocolate set quickly, minimizing the chance of it oozing out of your desired shape. Melt your chocolate and fill in the “features” with it carefully, first by doing an outline of the shape (important) and then fill it in on the inside. I used my little pen tool (pictured above — love that thing), but you can use a pipping bag with a narrow fitting or a squirt bottle, etc. I felt like the separate chocolate “features” give you a lot more control and a bit more texture. 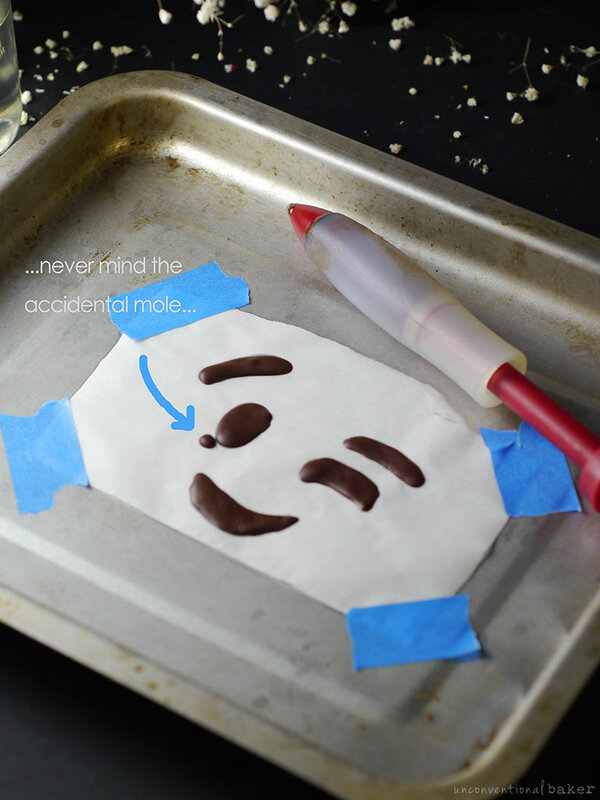 And minimize screw-ups… Otherwise, my wink emoji cake could have had a mole! ? In my book Unconventional Treats there is a beautiful grain-free chocolate cake that would work great here, too. 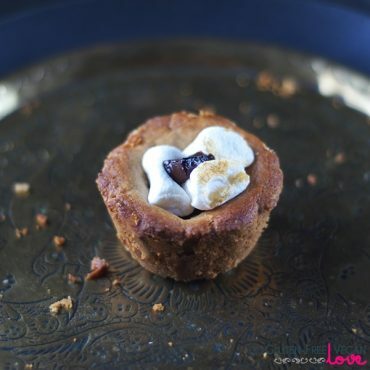 In my book Unconventional Treats there is a beautiful golden cheesecake that would work amazing for this. Use a white frosting of your choice and color it with a touch of turmeric for a natural yellow (or a natural yellow dye — like India Tree — if you really don’t like turmeric). 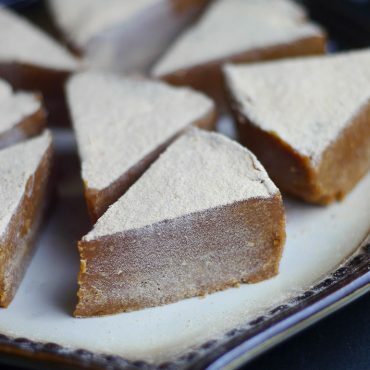 I used a frosting I love that’s a combination of coconut butter, tofu, agave, and lemon juice — almost the same as the frosting on the classic vanilla birthday cake (recipe below)(nut-free). In my book Unconventional Treats there is a beautiful cashew apricot frosting that would work brilliantly here. Can make the top a softer frosting, like the one on the carrot cake here. 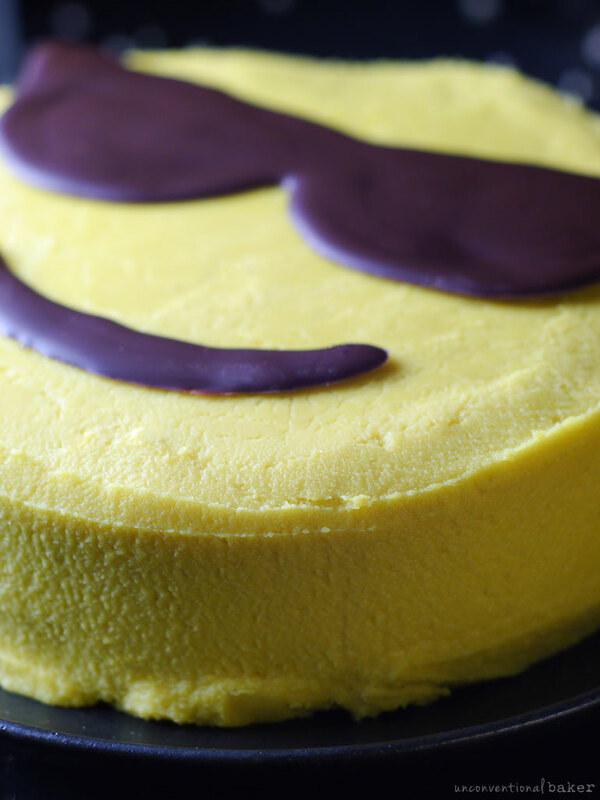 Go with a raw cake that you can just naturally color yellow and forgo the frosting altogether. – I just melted some chocolate I had on hand, and thinned it out with a tiny hint of coconut oil for easier handling (you can use any chocolate or carob bar you like and skip the oil, or use cacao butter instead if sensitive to coconut). 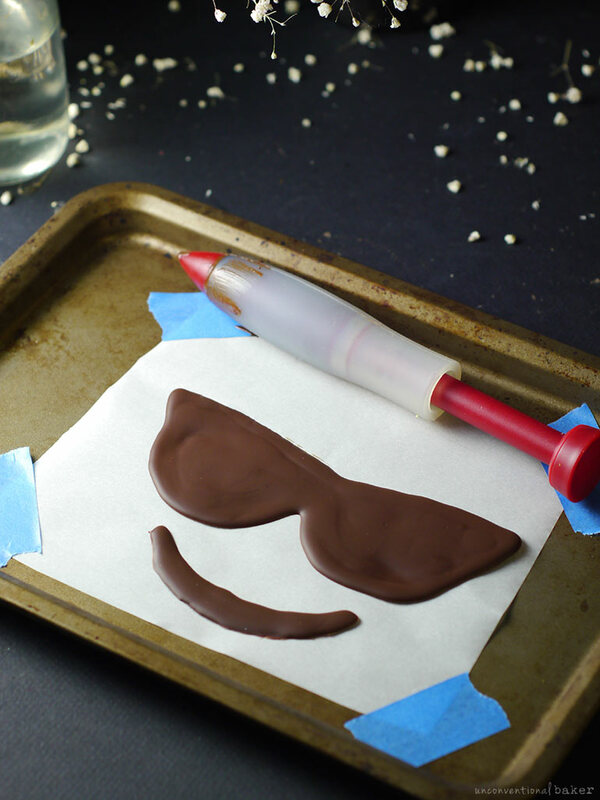 Use this DIY magic shell recipe to make your own chocolate. Advantage: control over ingredients, can make it out of carob if you prefer. Note: beware it’s thinner than a typical melted chocolate, so let it cool a little and work more carefully. Did I cover everything? I sure hope so ? That was a long one, wasn’t it…? Sorry, I couldn’t resist ? P.S. Note: the recipe below is for a single 6″ cake. Double for a 9″. I just thought the smaller cake size was more easily workable. 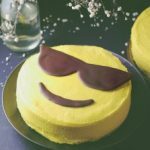 A fun emoji cake tutorial for turning your favorite gluten-free vegan cake into a smiling emoji using whole food ingredients for coloring. Prepare the frosting by combining all the ingredients in a power blender until completely smooth (use the vitamix tamper to help you along, or pause to scrape sides and keep blending until the coconut is incorporated). Transfer into a glass container and freeze until cake is ready to be frosted (or for at least 4-5 hours to let it firm up). Pre-heat the oven to 350F. Oil a 6″ cake pan. Set aside. In a small bowl combine the plant milk with vinegar and set aside, allowing it to curdle a little while working on next step. Combine all dry ingredients in a large mixing bow. Add in all liquid cake ingredients, including the almond vinegar mixture, and mix everything thoroughly to combine. In a separate bowl combine the cashew butter with the boiled water and stir to thin out and dissolve the cashew butter. Add this to the cake batter and mix everything to combine. 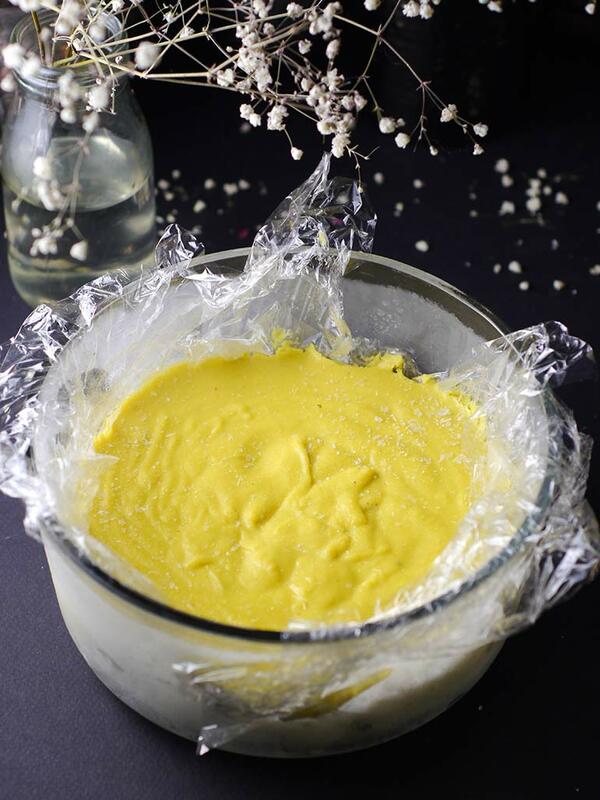 Pour the batter into prepared cake pan. Bake in a preheated oven for approximately 40 mins (until the top is lightly golden and a skewer inserted in the center of the cake comes out dry). 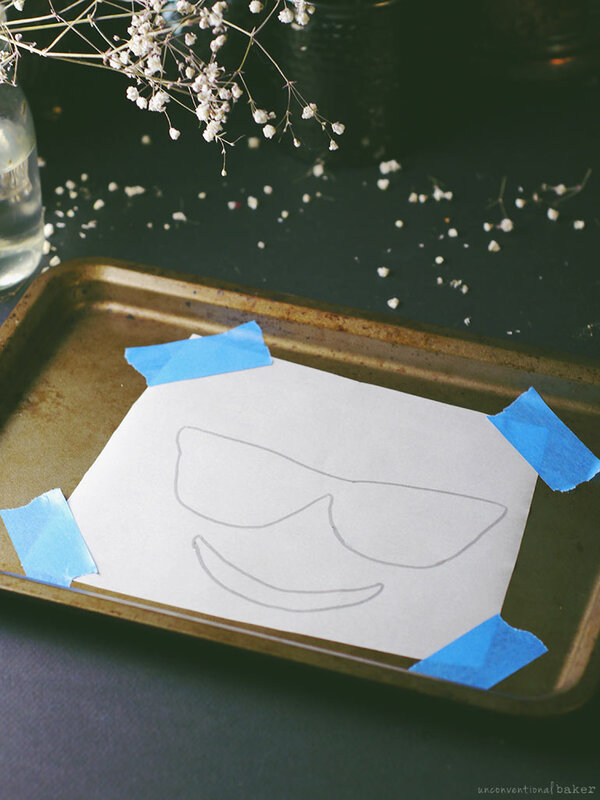 Remove from oven and cool on a cooling rack completely before proceeding to frost. Once cake and frosting are cooled enough, frost cake, and place in the fridge. Prepare the chocolate “features” as per instructions in the post above). Decorate cake and enjoy! Keep it chilled or refrigerated. Disclaimer: this post contains affiliate links to the frosting pen, the 6″ pan I used, orange blossom water and a natural yellow food dye alternative. I wish I could post a picture of my huge fail at this. Putting the parchment paper in the freezer made it bumpy, then the features ran uncontrollably. It was hilarious, just like the emoji I tried to replicate??? 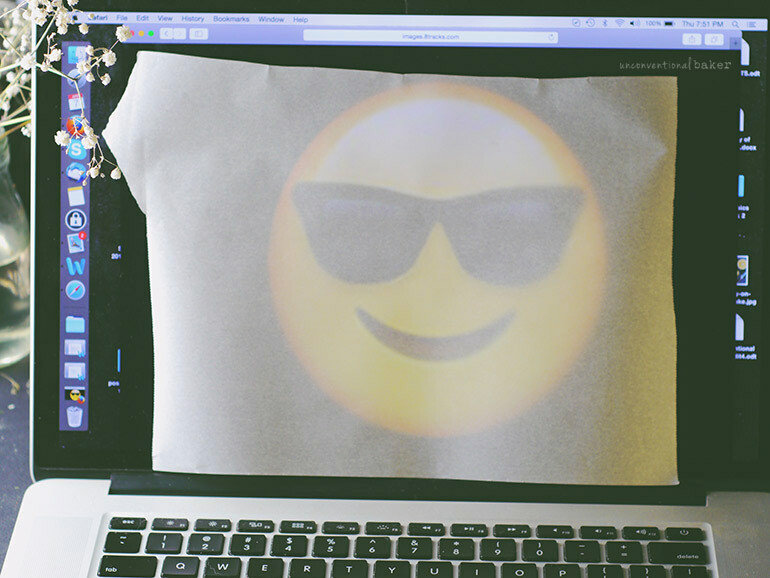 Were you able to remake the emoji part separately afterwards? Haha. That would be a toughie.. but hm… now I’m interested to try it! ? Aw, well that’s just what I was hoping for — good giggles ? My Cupcake Addiction videos?! What are those? :) And yes, I love the snazzy menu things — just a shortcode in the new theme, but makes things a lot neater.